Twitter – Are you kidding me? This is – without a shadow of doubt – a very dark day in the world of social media. The following is an excerpt from a post by Kate Knibbs at Digital Trends that appeared on November 27, 2013. Twitter recently introduced a revamped age-verification system to deter underage users from following the accounts of alcohol brands. 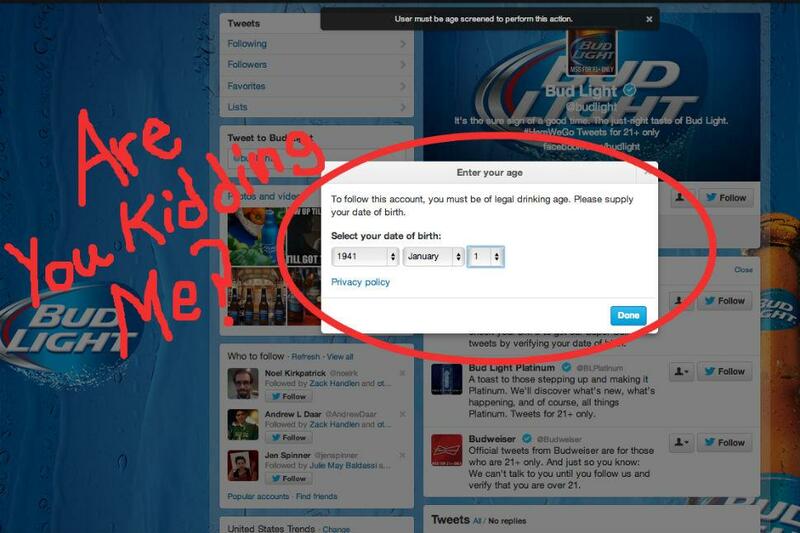 So if a 17-year-old wants to see what Bud Light has to say on Twitter (which, honestly, not sure why that would be something they’d want to do, but OK) they will now be confronted with an adult verification system asking for their date of birth before they’re allowed to follow. Twitter compares the age entered to the legal drinking age of the Twitter user’s country, and bars users from following the alcoholic brand if they’re under the limit.